The PFL20 Linearstep is an efficient, high thrust tin-can linear actuator with just a 20mm diameter and a bipolar winding. It is RoHS-compliant, has a 30/60-mm effective stroke, and can put out 6 N of force at 200 pps. With 24 steps per revolution, the lead screw has a 1.2-mm thread pitch. Its rated voltage is 5 V, has a resistance of 33 Ohms per phase and inductance of 12mH per phase. The simple structure of the – just a threaded rotor hub and lead screw – saves space and reduce costs, thanks to fewer components needed compared to devices that convert rotary motion to linear. 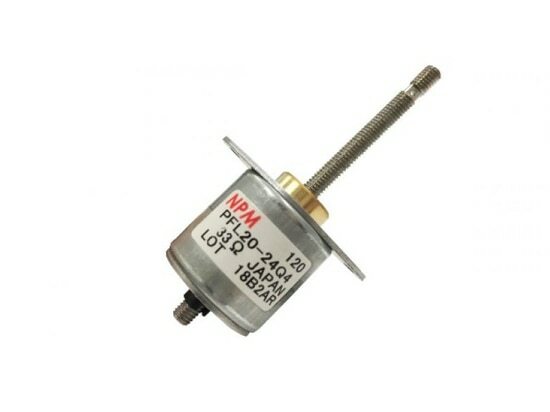 The motors are said to be easy to control and can be ordered with unipolar or bipolar windings and a variety of usable voltages. In addition to the 20mm motor size, this motor is also available in 25mm (captive or non-captive option) and 35mm diameter sizes. They can also be customized.